Please note, all APICS Exam Content Manuals are available free to members via e-download here and also under the Member Benefits page in My APICS. If you are not an APICS member, click here to join or to view all the benefits available to our members. This product is for the new CPIM program Version 6.0 available September 2017. If you are looking to purchase the ECM for the current CPIM program Version 5.0 please visit product http://www.apics.org/cpim-ecm-v5-edownload. 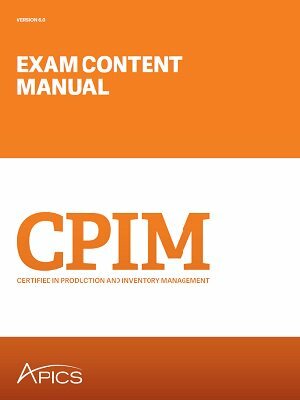 The APICS CPIM Exam Content Manual eDownload provides an overview of CPIM Parts 1 and 2; including an outline of the CPIM body of knowledge, and recommended references. Each outline is divided into major topic areas and the relative emphasis of each of the topics is indicated by a percentage figure. A list of key terminology for Parts 1 and 2 is included, along with illustrative questions for each module. Use this to guide your exam preparation—whether you study on your own, attend a class taught by an APICS partner, or are a part of a corporate learning group. The CPIM Exam Content Manual, V6.0 eDownload is printable. This eDownload is available for 395 days from the point of purchase. eDownload products are not returnable. With the purchase of this product you are entitled to access to the CPIM Online Study Tools. So that we can provide the appropriate access to you, we will need you to select a purchase type to indicate how you would like the activation code to be distributed. You are an APICS Channel Partner or Corporate Services Client who wishes to have the activation codes available for distribution through your CPIM Online Study Tools administrative access. Questions? Contact ASCM Customer Relations at support@ascm.org or 1-800-444-2742 or +1-773-867-1777 from 8:00 a.m.ï¿½5:00 p.m. CT.